The term 'livery vehicle' is used in to denote a vehicle for hire, such as a chauffeured limousine. The term comes from the time when cabs or coaches were available only through the services of a livery stable. Usually the drivers or chauffeurs were uniformed, according to which company they represented. These days Livery Limousine refers to any limo hired for transportation. In Canada , the term is often used simply to refer to luxury sedan cars which are used as public conveyances. 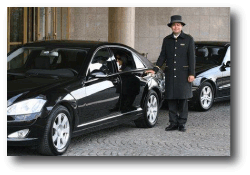 Today most or all of the limousine services feature 'liveried' or uniformed drivers and the term really is interchangeable with the term limo service. Our Livery limos are available to the general public for anything from a wedding to a couples' night out. It means providing a modern, comfortable, vehicle which is at your service for the length of time it is hired. Our livery limo service will rent vehicles for an hour or an afternoon, or however long the customer needs the service. The cars come in all sizes, and can accommodate up to 30 people in our special stretch limousines. Our company can either be called a limo service or a livery limo service, but they will both provide the same dependable, courteous, service that you, as a customer, expect. And the cost is far less than you might believe. Just contact us for an estimate for the service you will require and our friendly customer rep will sfill you in. Livery Limo Services are often called upon for weddings, anniversaries, funerals, birthday parties, high school proms and a night out on the town. There is nothing dearer to the heart of a teenage than to be picked up and dropped off at the annual formal prom. It gives a feeling of being an 'adult' for that magical evening they will never forget. When there is a funeral in the family, our livery limo service is the perfect way to travel to and from the cemetery. The bereaved need all the comfort they can get at this time, and our livery limo service will do whatever we can to decrease the stress on the family. Weddings definitely call for a livery limo service. The bride is usually dressed in a long gown and does not want to drive in an unclean or messy car. With our livery limo service you can be certain that the interior will be spotless and luxurious for the 'woman of the hour.' The wedding procession of livery limos is impressive and is appropriate for that very special day. Make is a drive to remember with our livery limo service.